Do Something That’s Good for Koalas and is also Good for You! Friends of the Koala welcomes new volunteers at anytime. We currently have about 130 active local volunteers who, for insurance purposes, are aged over 18 years of age and members of our organisation. Appropriate training, either one-to-one or through a more formal training session, is essential for anyone wishing to be involved with hands on care of koalas, and we provide this as needed. All our volunteers abide by our FOK Code of Conduct [31KB] to protect the health and safety of our koalas. In return, volunteering with us is well worth it for the experience of being so close to these special animals and also part of an organisation with great team spirit, lots of support and friendly faces. If you’re interested in volunteering call Lola, our Volunteer Coordinator on 0412 753 739. Our volunteers clean koala runs, select appropriate leaf for them and ensure they’re eating the leaf. This can mean as little as 2 hours commitment each week and gives volunteers the privilege of connecting closely with (although not holding) these precious animals. With dedication and training, volunteers can assist with their medications and diagnosis. Volunteers learn how to identify the preferred koala food trees (KFTs) in this area and each weekday morning, working with at least one other leafer, harvest the required amount of leaf needed that day and take it to the Care Centre in our Rescue Van. This takes a commitment of about 3 hours, and we always need some young(er), fit people to take this on. Volunteers staff our Rescue Hotline 24/7 and those in the Ballina, Byron Bay, Kyogle, Lismore, Richmond Valley or Tweed council areas can become experienced rescuers of injured and sick koalas. This requires significant ongoing commitment, as well as skills that we’re happy to provide. Volunteers conduct educational talks, maintain the nursery, lobby local Councils, draft submissions for funding or on legislation that affects koalas and complete necessary administrative tasks. If you’re not already a member and want to volunteer, the first step is to become a member, and on your membership form let us know the area you would like to be involved in. Then keep an eye out for the next training courses advertised in our newsletter Treetops, on the web and in the Care Centre or email us at info@friendsofthekoala.org. From time to time we have inquiries as to whether we provide opportunities for international visitors to volunteer with us. Yes, we do and we welcome them! We’ve had a number who have worked beside our experienced volunteers, which has been positive both for us and also for the volunteers. a commitment to the FOK Code of Conduct. If you’re interested and meet these criteria, and want to find out more about Lismore, possible accommodation and other things to do around Lismore click here. To express interest in volunteering, send us an email to info@friendsofthekoala.org letting us know when you’d like to come and providing us with some details about yourself. More experienced volunteers with some special facilities provided by us can either have koalas in ‘soft release’ prior to their being released to the wild or, if they have received exceptional training and have the right temperament, can look after orphan joeys until they’re old enough to go into care and then be released into the wild. Anika is one of Friends of the Koala’s special orphan joey carers and as we are often asked about what this entails, we asked Anika to tell us her story. ‘I volunteered in the wildlife hospital with koalas for 4 years, learning much about them and also how to handle them with care. I kept asking questions and the hospital manager thought she could get rid of me by saying I could become a carer, so with her 24/7 help I jumped into it. By that time I had been rescuing koalas for about 5 years and anyone interested in becoming an orphan joey carer will need to have some basic knowledge, a trusted network of experienced carers to call 24/7, to attend all workshops and keep asking questions. A typical day for a carer starts at 5.30 am when I prepare for the last feeds of the night, feed the joey(s) and make sure their bedding is clean, warm and dry, so they can go to sleep. That’s when our job starts: washing the pouches and bedding, cleaning and sterilizing the bottles, teats and syringes that I have used that day, and making up fresh milk for the next 24 hours. If the joey is small there will be another feed around 10-11am, and if the joey is big enough it will probably sleep until 2-3 pm and I will have a bit of time to myself. They will need fresh leaf for the afternoon, so we’ll go out and cut it (sometimes a 2 hour round trip). After the first afternoon feed we get rid of yesterday’s leaf, clean the leaf pots and put fresh leaf in. (Hopefully I’ll have time to feed the rest of the family before the evening feeds start). Most of the time we ‘feed by demand’ which means the joey will let us know when it wants a feed. This can be every 2 hours in the evening and 3-4 hourly through the night. Of course there will be play time too – usually anywhere between 11pm – 2am, and before we know it, it’s 5.30 again! This is a ‘normal’ day, as on ‘special’ days we drive to the wildlife hospital for a check-up or treatment, which takes another minimum 3 to 4 hours out of our day. The best thing about being an orphan joey carer is knowing that you are making a difference to every single individual that comes into your care, getting to know their personalities, seeing them grow up, getting better and stronger and moving on to the next enclosure. And apart from the animal side of it, I have found some amazing friends amongst the carers. We feel the same, understand the pain, forgive any mistakes, help each other out and are always there for each other. The worst thing about being a joey carer is losing them or having to watch them not thriving. Sometimes I wish I could carry their pain or discomfort. With all the equipment available to the vets, and all the tests that can be done, sometimes the joey has an issue that we don’t know about. You won’t know until weeks or months later when all of a sudden something is not quite right and they die in your care. Another challenge is that koala carers all get to the stage where our shoulders go bad from cutting the leaf, every single day, big sticks and at least 5-6 per koala per day. If you decide to be a joey carer you will need to commit for a long time – sometimes up to a year or more – as we have a ‘one mum’ policy. You will need to know their food: i.e. your leaf species, and get it fresh every day, even when it’s bucketing down or go out at 5 am on those really hot days! If you care for koala joeys, a few things will be over-rated especially sleep and a social life. You will need to think about your commitment, be prepared to make long hours and live like a zombie - but OMG when it comes to a release…. That’s the very best part of it all! It makes everything worthwhile’. If you would like to train to carry out this volunteer role call Lola, our Volunteer Coordinator, on 0412 753 739 or email her at info@friendsofthekoala.org. Friends of the Koala was fortunate enough to have Nadine Kuhn from Germany, volunteer full time Monday to Friday for the entire month of January. With Koalas being her favourite animal, Nadine loved the nature of our work and took on all aspects of volunteering with ease. We will definitely miss Nadine’s positive outlook and can-do attitude, we hope she returns soon! Here is her story. Before I came to the rehab centre I had a vague idea that koalas were a threatened species but was shocked when I realised the extent of the problem. During the last 4 weeks we admitted a huge number of injured and/or sick koalas to the centre but only 2 of them actually survived. Almost every patient was suffering from Chlamydia or Cystitis which must be extremely painful and is often fatal. I was lucky enough to go to a few appointments at the local vet who was working for free, just as the vet nurse and all the other volunteers running the centre do. Witnessing this high level of dedication from so many different personalities and backgrounds was very inspiring! At the same time I´m still shocked that the government provides no funding for the rehabilitation centre and that there are no laws to protect koala habitat. It was also concerning that many citizens of Lismore either had no idea about the existence of the koala centre in their hometown or that koalas are running straight into extinction unless the laws change. ‘We all have a voice to change the things that are important to us. It doesn’t matter if we have 1 follower or 1 million followers, we all can start an online petition, send letters to the council, publish articles or find other ways to fight for the things we believe in. We don’t need somebody else to be the voice of our own message’. I can absolutely recommend volunteering with Friends of the Koala as it´s been more rewarding than any paid job could be, especially seeing them being released back into the wild! I’ve learned so many things about koalas, their treatment, eucalyptus species and how to make a difference as an individual. Thanks to absolutely everyone at Friends of the Koala. I had a terrific time and will definitely keep volunteering for endangered species all over the world! Care Coordinator Susannah holds koala joey Frazer while Dr. Camille listens to his breathing. Arranging the best care for rescued koalas is a huge job. “Some days it can be crazy with koala after koala coming in,” says Susannah Keogh our Care Coordinator. 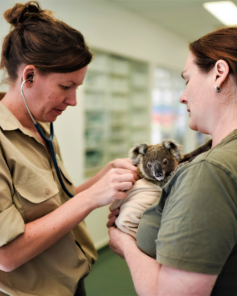 Susannah manages the care of 300 koalas brought into our Care Centre annually, but last year a spike in admissions saw 430 koalas in need of help from carers and veterinarians. Woefully, only one in six is fit to return to the wild, so the Care Coordinator’s role is charged with difficult decisions. It is tempting to think euthanising a koala may be the toughest part of the job, but it can be tougher explaining such decisions and complexities surrounding koala suffering to those involved. Furthermore, “dealing with naivety in terms of what koalas need can be frustrating,” says Susannah. Recently a small joey was found by a person who kept it at home for a week and feeding it on cow’s milk thinking this was the right thing to do, but the joey died as a result. Although a thankless role at times, the rewards are great – friendship, learning and most importantly, successful releases. “Once you’re involved with koalas and learn how difficult they can be, talking to someone else who really understands, and revelling in the joys of a koala release is wonderful” says Susannah.